SFX guru and director Mike Diva has shown a love for gaming on his YouTube channel a number of times. 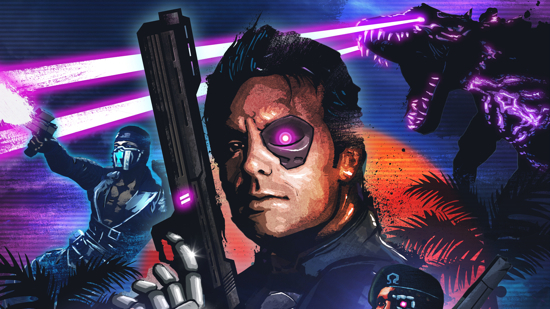 Last year Mike put out an awesome homage to both Far Cry 3: Blood Dragon embracing pure 1980’s goodness just like the game and then to Mortal Kombat with a killer fight scene and phenomenal Easter egg joke inserted in there too. You can check out both on his YouTube channel. It’s difficult to put into words just how great this trailer is. However, as we get paid by the word around here, we should at least give it a try. Well, to be sure, it’s amazing. So many great bits and so much pop culture and old-school sci-fi/action b-movie nostalgia all rolled into a slick package. 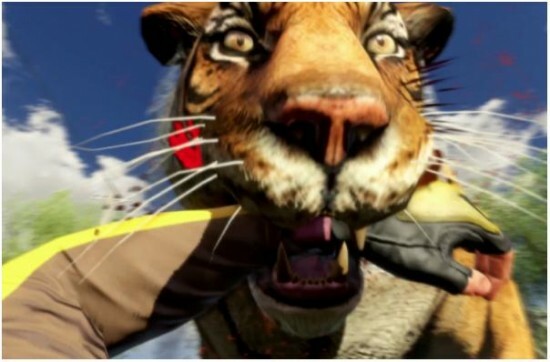 And hey, the game, a stand-along expansion to Far Cry 3 itself, looks pretty fun too. It even stars famous sci-fi actor Michael Biehn, which is pretty cool. If you haven’t seen this trailer for Far Cry 3: Blood Dragon, you should. In fact, click through immedietly and watch it. You won’t be sorry. Once you watch it, be sure to buy the game too. We need to support things like this. Far Cry 3: Blood Dragon is available now for PS 3 via the Playstation Network and XBox 360 via XBox Live Arcade. Last week we reported about the leaked image attached to the title Assassin’s Creed IV: Black Flag. This new Assassin’s Creed game rumor lined up with previous statements about a new lead character and a new locale as well. Yesterday, Ubisoft revealed these rumors to be true with an official trailer revealing the game as well as a character trailer showing off the new protagonist Edward Kenway. The first trailer starts off with Blackbeard (coincidentally, Blackbeard was who I researched to give the possible time frame that the events of the game will take place when looking at famous pirates in history). This means that the game has to take place before the events of Assassin’s Creed III since Blackbeard was dead by 1718. This could be an indicator that Desmond Miles may in fact not be the modern day protagonist for the game as well as Desmond’s memories took place chronologically. Earlier this month, Ubisoft CEO Yves Guillemot revealed that there would indeed be a new Assassin’s Creed title released in fiscal 2014 (April 1, 2013 to March 31, 2014) from the publishing giant. He also noted that it would be taking place in a new location with a new lead character as well. After the ending of Assassin’s Creed III, many were speculating if this only meant Connor being replaced or if the modern day Desmond would be on the chopping block as well. Well, speculate no longer it seems. Yesterday gaming news site Kotaku reported a leaked marketing image and the name Assassin’s Creed IV: Black Flag. 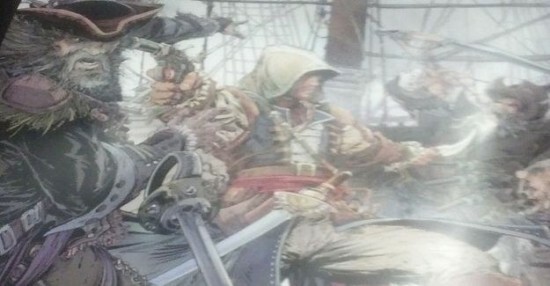 The image shows a hooded assassin character holding a sword in one hand and pistol in another while surrounded by pirates. This would fit right in with Yves’s statement about a new hero and location. 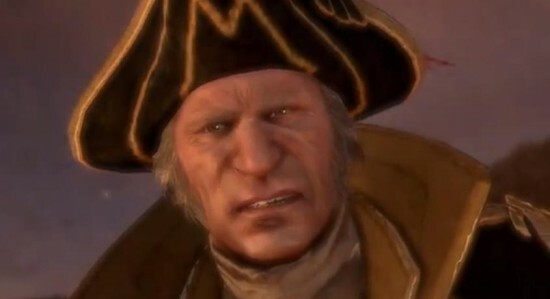 The other day when looking back at the proud leaders of this great nation, I opted to shy away from the fantastic portrayal of General turned King George Washington in the alternate history DLC of Assassin’s Creed. But after showing proper respect two whole days ago and the DLC releasing, it doesn’t seem right to not share the launch trailer for “Tyranny of King Washington: The Infamy” DLC which hit the digital marketplace yesterday. In this trailer, the question is posed about what would have actually happened to General Washington had he not stepped down as President at the end of the Revolutionary War. In this alternate timeline, Washington is corrupted by his power and declares himself king and it looks like it is up to Connor to stop him. This has been a personal pet peeve of mine since DLC began supporting on disc unlocks. If it’s on a disc, that means it was completed before the game was sent to print. In my mind, the price I paid for the game disc should include all of that content on said disc. There aren’t extra man hours being created to produce new content after the game was completed which is why most people pay for additional DLC like map packs in Halo or Call of Duty. It is literally players just being given a key to unlock what is on the physical media they already have in their possession. Most people who consider themselves “Real” gamers and are over the age of 20 have probably played Super Mario Bros. more times than they can count and can most likely play through the first level blindfolded and know where every Goomba and Koopa Troopa is. But those Goombas and those Koopas are going to be there every time and noting is going to change, in this game or any other. Or is it? In fact, the rules of gaming changed and a random element was introduced. 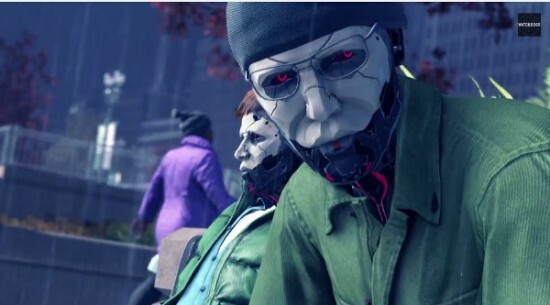 While there were still some static NPCs and scripted events that were required for the progress of a game’s story, an open world based on behavioral patterns and the sandbox was born. One of the greatest early sandbox games was Grand Theft Auto which put players in a city that reacted to their actions. But when it made the shift to a 3D environment the world and the interactions changed along with it. But it still didn’t feel like the world was truly alive. For the most part, passersby would go without noticing the player or each other with the exception of pathing themselves out of the way of each other or reacting to the actions of the player. There was no fully random aspect to their interactions with each other or the world itself. But then things changed again. Don’t worry. We aren’t giving any more awards to Angry Birds. At least not today. But we do have four more games for the best of 2012. If you haven’t seen the previous two days awards, click here for Monday’s and here for Tuesday’s awards. Make sure to check back tomorrow for our final specialty awards and then again on Friday for the ultimate award from The Flickcast and Bitcast teams, the Game of the Year. With writing from R. A. Salvatore and art design by Todd McFarlane, many would have thought that Kingdoms of Amalur: Reckoning would have the makings of a surefire hit. With over 300,000 units sold by March of 2012, Reckoning gave a good showing for a brand new IP and had many people talking about it. Unfortunately due to financial problems with a loan from the state of Rhodes Island, 38 Studios was forced to close and with it went the possible future of the Kingdoms of Amalur series. Despite coming from a brand new studio, Reckoning had all the makings of a hit game. Beautiful design, interesting and complex story with tons of back matter and, the most important, incredibly fun combat and gameplay. It was a huge world with tons to do that players could get lost in. Whether or not they even cared about the narrative, there were unending areas to explore and enemies to vanquish. Now, one can only hope that someone else picks up this IP and gives it a second chance to continue giving more people the chance to explore its epic world. What Should Happen to THQ? Since we started covering games, we have always had an eye on THQ and its franchises. From the WWE and UFC fighting games to fantasy adventures like Darksiders and sci-fi worlds of Warhammer 40,000: Space Marine to even the modern day gone wrong Saints Row, THQ has been a huge part of gaming for the better part of the past twenty years. 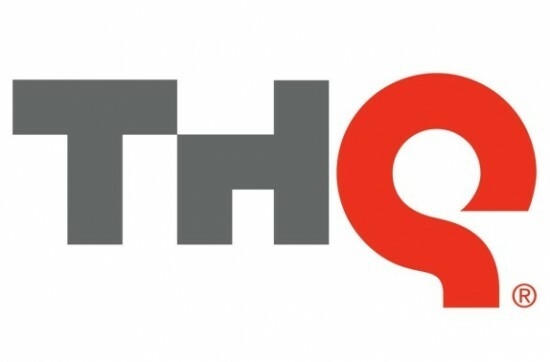 Unfortunately, this past week THQ was forced to declare bankruptcy in hopes of somehow finding a way to save the jobs of as many employees as possible and keep their games in progress still alive. There are a few options to what could happen to THQ. First, it could be bought out by another company and have its portfolio absorbed into the new company including licenses. Another option would be the company dissolves and its assets including studios are auctioned off. If either were to happen, it is possible that we would see some of the THQ franchises picked up by other studios and studios picked up by other publishers. But the question then begins, what would the good combinations be for publishers and studios as well as studios and franchises.